Min-Max Normalization : There is where the normalization is based on the using the minimum value for the shift and the (maximum-minimum) for the scale. Z-Score Normalization : This is where the normalization is based on using the mean value for the shift and the standard deviation for the scale. When using Automatic Data Processing the normalization functions are used. But sometimes you may want to process the data is a more explicit manner. To do so you can use the various normalization function. To use these there is a three stage process. The first stage involves the creation of a table that will contain the normalization transformation data. The second stage applies the normalization procedures to your data source, defines the normalization required and inserts the required transformation data into the table create during the first stage. The third stage involves the defining of a view that applies the normalization transformations to your data source and displays the output via a database view. The following example illustrates how you can normalize the AGE and YRS_RESIDENCE attributes. The input data source will be the view that was created as the output of the previous transformation (MINING_DATA_V_2). This is passed on the original MINING_DATA_BUILD_V data set. The final output from this transformation step and all the other data transformation steps is MINING_DATA_READY_V. INSERT_NORM_LIN_SCALE Inserts linear scale normalization definitions in a transformation definition table. INSERT_NORM_LIN_ZSCORE Inserts linear zscore normalization definitions in a transformation definition table. Open a terminal window and run the following command. This will download and extract all the image files. Consider creating a shell script for this, to make it easier each time you want to run the image. Now seed Hive with some data. The typical example uses the IRIS data set. Run the following command to do this. This script downloads the IRIS data set, creates a number directories and then creates an external table, in Hive, to point to the IRIS data set. Now open Hive and list the databases. Connect to the IRIS database and list the tables within it. Find the min and max values for each feature. 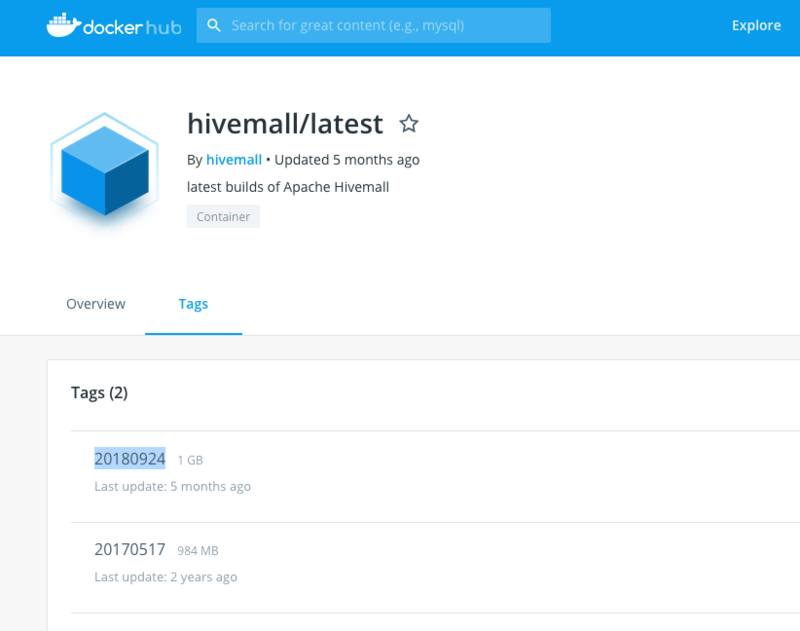 You are now up and running with HiveMall on Docker. 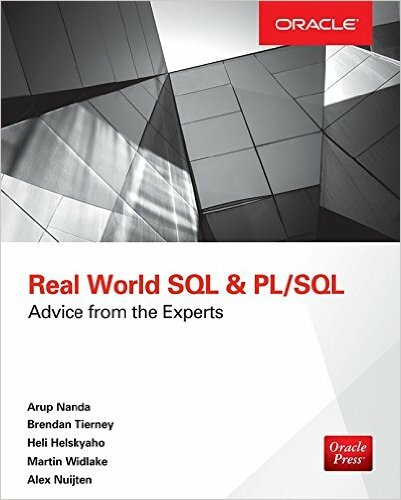 It is widely recognised that SQL is one of the core languages that every data scientist needs to know. Not just know but know really well. If you are going to be working with data (big or small) you are going to use SQL to access the data. You may use some other tools and languages as part of your data science role, but for processing data SQL is king. During the era of big data and hadoop it was all about moving the code to where the data was located. Over time we have seem a number of different languages and approaches being put forward to allow us to process the data in these big environments. One of the most common one is Spark. As with all languages there can be a large learning curve, and as newer languages become popular, the need to change and learn new languages is becoming a lot more frequent. We have seen many of the main stream database vendors including machine learning in their databases, thereby allowing users to use machine learning using SQL. 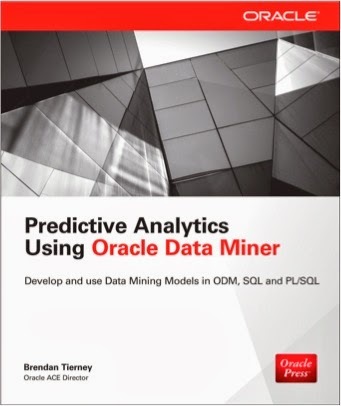 In the big data world there has been many attempts to do this, to building some SQL interfaces for machine learning in a big data environment. One such (newer) SQL machine learning engine is called HiveMall. This will allow anyone with a basic level knowledge of SQL to quickly learn machine learning. Apache Hivemall is built to be a scalable machine learning library that runs on Apache Hive, Apache Spark, and Apache Pig. Hivemall is currently at incubator stage under Apache and version 0.6 was released in December 2018. 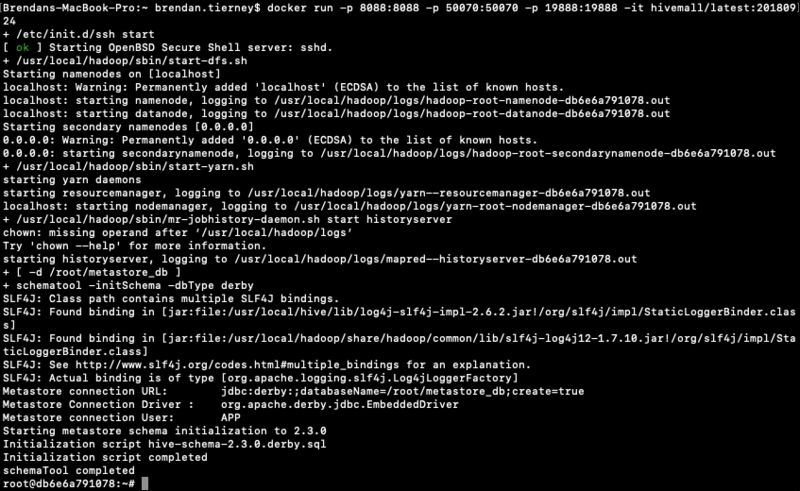 I've a number of big data/hadoop environments in my home lab and build on a couple of cloud vendors (Oracle and AWS). I've completed the installation of Hivemall easily on my Oracle BigDataLite VM and my own custom build Hadoop environment on Oracle cloud. A few simple commands you will have Hivemall up and running. Initially installed for just Hive and then updated to use Spark. Hivemall expands the analytical functions available in Hive, as well as providing data preparation and the typical range of machine learning functions that are necessary for 97+% of all machine learning use cases. You might want to create a new DB in Hive for your Hivemall work. Hivemall for ML using SQL is now up and running. Next step is to do try out the various analytical and ML functions. Ethics is one of those topics that everyone has a slightly different definition or view of what it means. The Oxford english dictionary defines ethics as, 'Moral principles that govern a person's behaviour or the conducting of an activity'. As you can imagine this topic can be difficult to discuss and has many, many different aspects. In the era of AI, Machine Learning, Data Science, etc the topic of Ethics is finally becoming an important topic. Again there are many perspective on this. I'm not going to get into these in this blog post, because if I did I could end up writing a PhD dissertation on it. But when you start working of projects examining individuals and their behaviours then you do need to examine the ethical aspects of such work. Everyday we experience adverts, web sites, marketing, etc that has used AI, Machine Learning and Data Science to delivery certain product offerings to us. 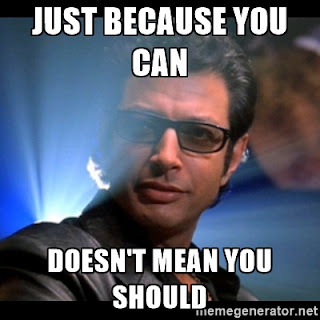 Just because we can do something, doesn't mean we should do it. One particular area that I will not work on is Location Based Advertising. Imagine walking down a typical high street with lots and lots of retail stores. Your phone vibrates and on the screen there is a message. The message is a special offer or promotion for one of the shops a short distance ahead of you. You are being analysed. 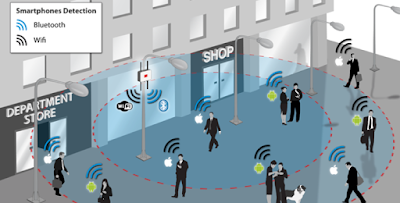 Your previous buying patterns and behaviours are being analysed, Your location and direction of travel is being analysed. Some one, or many AI applications are watching you. This is not anything new and there are lots of examples of this from around the world. But what if this kind of Location Based Advertising was taken to another level. What if the shops had cameras that monitored the people walking up and down the street. What if those cameras were analysing you, analysing what clothes you are wearing, analysing the brands you are wearing, analysing what accessories you have, analysing your body language, etc. They are trying to analyse if you are the kind of person they want to sell to. They then have staff who will come up to you, as you are walking down the street, and will have customised personalised special offers on products in their store, just for you. See the segment between 2:00 and 4:00 in this video. This gives you an idea of what is possible. As an AI, Machine Learning, Data Science professional, are you Ok with this? Just because we can, doesn't mean we should! We keep hearing from people about all the computing resources needed for machine learning. Sometimes it can put people off from trying it as they will think I don't have those kind of resources. Check out my previous blog post that used data sets containing 72K, 210K, 660K, 2M and 10M records. There was some surprising results in those these. In this test, I'll be using Python and SciKitLearn package to create models using the same algorithms. There are a few things to keep in mind. Firstly, although they maybe based on the same algorithms, the actual implementation of them will be different in each environment (SQL vs Python). With using Python for machine learning, one of the challenges we have is getting access to the data. Assuming the data lives in a Database then time is needed to extract that data to the local Python environment. Secondly, when using Python you will be using a computer with significantly less computing resources than a Database server. In this test I used my laptop (MacBook Pro). Thirdly, when extracting the data from the database, what method should be used. I've addressed these below and the Oracle Database I used was the DBaaS I used in my first experiment. This is a Database hosted on Oracle Cloud. This kind of depends on how you do this. 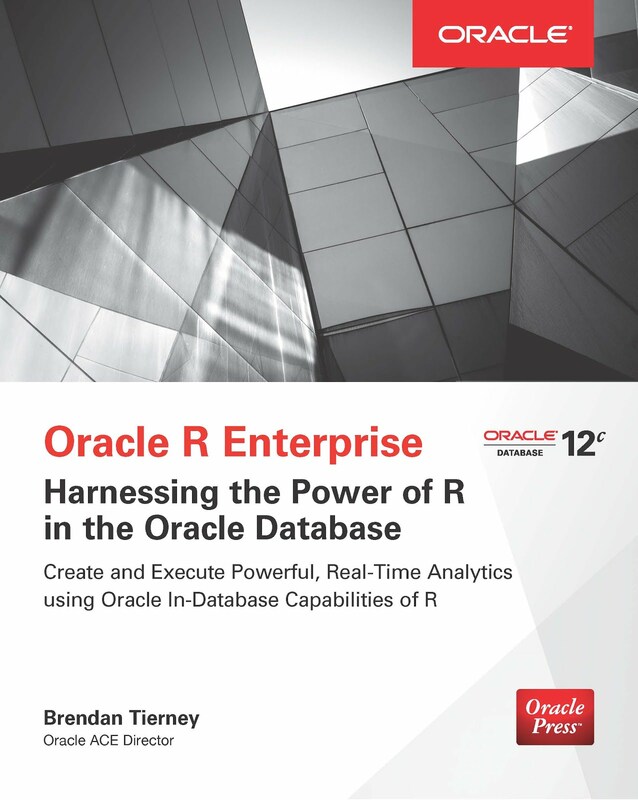 There are hundreds of possibilities available to you, but if you are working with an Oracle Database you will probably be using SQL Developer. I used the 'export' option to create a CSV file for each of the data sets. 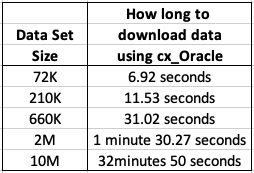 The following table shows how long it took for each data set. As you can see this is an incredibly slow way of exporting this data. Like I said, there are quicker ways of doing this. 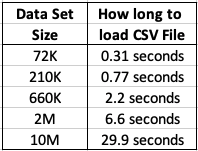 After downloading the data sets, the next step is to see how load it takes to load these CSV files into a pandas data frame in Python. The following table show the timings in seconds. You can see that Python is very efficient at loading these data sets into a pandas data frame in my Python environment. As I'll be using Python to create the models and the data exists in an Oracle Database (on Oracle Cloud), I can use the cx_Oracle package to download the data sets into my Python environment. After using the cx_Oracle package to download the data I then converted it into a pandas data frame. You can see that using cx_Oracle to download the data is a very efficient way of accessing the data. 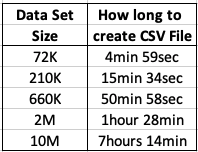 But if the data already exists in CSV files, then the previous method would be quicker to use. I had the array fetch size set to 10,000. I also experimented with smaller and larger numbers for the array fetch size, but 10,000 seemed to give a quickest results. Now we get onto checking out the timings of how long it takes to create a number of machine learning models using different algorithms and using the default settings. 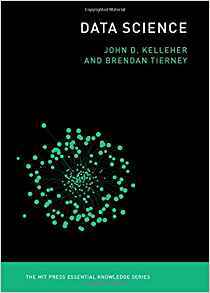 The algorithms include Naive Bayes, Decision Tree, GLM, SVM and Neural Networks. I had to stop including SVM in the tests as it was taking way too long to run. For example I killed the SVM model build on the 210K data set after it was running for 5 hours. The Neural Network models created had 3 hidden layers. In addition to creating the models, there was some minor data preparation steps performed including factorizing, normalization and one-hot-coding. 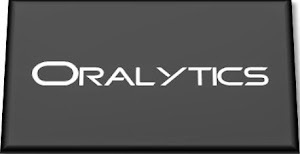 This data preparation would be comparable to the automatic data preparation steps performed by Oracle, although Oracle Automatic Data Preparation does a bit of extra work. At the point I would encourage you to look back at my previous blog posts on timings using Oracle DBaaS and ADW. You will see that Python, in these test cases, was quicker at creating the machine learning models. 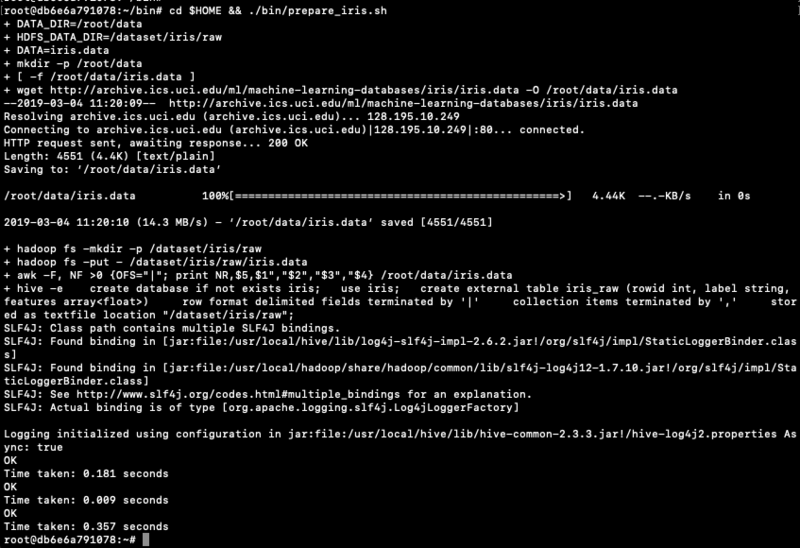 But with Python the data needed to be extracted from the database and that can take time! A separate consideration is being able to deploy the models. The time it takes to build models is perhaps not the main consideration. You need to consider ease of deployment and use of the models.